Dr. Jack Kevorkian was an American author, pathologist, instrumentalist, painter, composer, and euthanasia activist that was also known as Dr. Death. He was born on May 26, 1928 in Pontiac, Michigan to Armenian immigrants parents. His father Levon worked at an automobile foundry and his mother"s name was Satenig. Dr. Jack had two sisters, Margaret, who was born in 1926 and Flora. He graduated 1945 with honors from Pontiac Central High School, and he graduated in 1952 from the University of Michigan Medical School. He had completed his residency training in anatomical and clinical pathology before he did research on blood transfusions. He did not function well as a pathologist in the hospital and left the practice of medicine. He taught himself German and Japanese and was never married. He is known/recognized for assisting terminally ill patients with the right to die via physician-assisted suicide. Dr. Jack has claimed to have helped at least 130 patients to die/commit suicide. A lot of people consider Dr. Jack to be a hero and Dr. Jack is proud of himself as well and has said "Dying is not a crime." He was arrested in 1999 for helping someone with voluntary euthanasia and was found guilty of second-degree murder. He was sentenced to served 10 - 25 year in prison by Judge Jessica Cooper, she told him, "This is a court of law, and you said you invited yourself here to take a final stand. But this trial was not an opportunity for a referendum. The law prohibiting euthanasia was specifically reviewed and clarified by the Michigan Supreme Court several years ago in a decision involving your very own cases, sir. So the charge here should come as no surprise to you. You invited yourself to the wrong forum. Well, we are a nation of laws, and we are a nation that tolerates differences of opinion because we have a civilized and a nonviolent way of resolving our conflicts that weighs the law and adheres to the law. We have the means and the methods to protest the laws with which we disagree. You can criticize the law, you can write or lecture about the law, you can speak to the media or petition the voters." Dr. Jack was given parole on June 1, 2007 from a prison in Coldwater, Michigan with certain terms/conditions that he had to obey. His terms were; not to offer advice to anyone, not to participate or be present in any type of suicide, not to be involved with euthanasia and not to promote/talk about assisted suicide and its procedures. He suffered from kidney problems for several years and was diagnosed with liver cancer. He became hospitalized on May 18, 2011 with his previous kidney problems and now pneumonia. He died eight days after his 83rd birthday from Thrombosis in at William Beaumont Hospital Royal Oak, Michigan on June 3, 2011. Dr. Kevorkian was buried in Troy, Michigan at the White Chapel Memorial Park Cemetery with "He sacrificed himself for everyone"s rights." inscribed on his tombstone. Maria Silveira - "Dr. Jack Kevorkian didn"t seek out history, but he made history." Howard Markel - "was a major historical figure in modern medicine." The Catholic Church in Detroit - Kevorkian left behind a "deadly legacy"
Philip Nitschke - "moved the debate forward in ways the rest of us can only imagine. He started at a time when it was hardly talked about and got people thinking about the issue. He paid one hell of a price, and that is one of the hallmarks of true heroism." Dr. Jack Kevorkian serial killer is a male serial killer. Dr. Death is a male serial killer. 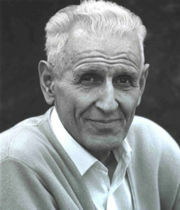 Dr. Jack Kevorkian is a male serial killer.